as a small boy, Britt was into superheros. but he got into trouble trying to be a good guy and was punished by his dad, the owner of an independent newspaper. as a result, he stopped caring and just became a party guy. then his dad died and left him the business. still mad with his dad, he recruited his dad's former coffee boy and all round handyman Kato, and they stole the head off his dad's statue in the park. while making their getaway, they came across a gang assaulting a guy and his girlfriend. so they punched out the gang (Kato did most of the action). nevertheless, they were reported in the news as just another bunch of thugs (since they vandalised Britt's dad's statue). so they decided to be good guys with a bad rep, and after coming up with a cool name, The Queen Bee, they never looked back. another superhero was born. 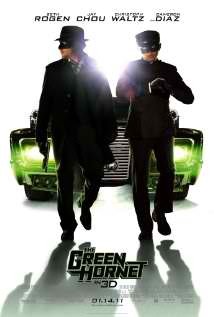 awesome comedy, not so much a superhero movie. Many times during the movie, i just had to laugh out loud. and the rest of the audience did too. Seth is the perfect cast for a bumbling superhero. Kato mangled his English - that was to be expected. Jay Chou is famous for mumbling in any language. you should, but not in 3D. watch it in 2D. it's more awesome that way. thanks, Jodie, for making me go to the movies.